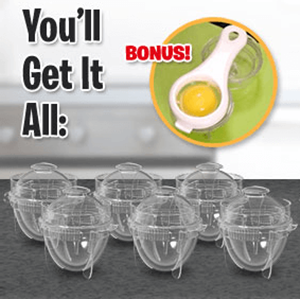 Egg Pops Review – Will it give you perfect hard cooked eggs? We’re entering into the time of year again when its back to the indoor entertaining. This means extra cooking, and when it comes to cooking hard boiled eggs and peeling them it can be a real hassle. Maybe the Egg Pops is going to make this easier. Egg Pops is a collection of small egg shaped containers that you use in the microwave to cook hard boiled eggs. Usually eggs cooked in the microwave, and especially scrambled eggs turn out pretty good. If you do it right. You have to be careful cooking eggs in the microwave otherwise they turn out rubbery. The Egg Pops is supposed to prevent this. All you have to do is crack the egg into one of the containers, fill the double boiler chamber with water, and pop them into the microwave. Then they are supposed to come out once done like a perfectly hard boiled egg that you can use in your recipes or eat just as they are. The company claims that using the Egg Pops is quick and easy. No having to wait for the water to boil in the traditional methods, then having to peel them. They say it only takes less than one minute for them to hard boil in the microwave. While five minutes using the traditional manner for cooking hard boiled eggs isn’t all that long, its the peeling of them that most people dislike. This is something the hype is focusing on here with the Egg Pops. We did do a review of a similar product in the past called Eggies. The feedback on that one was mixed because many people complained that it was way too difficult to get the eggs out of the containers once done, and the clean up of the containers was really difficult. Now with the Egg Pops they are saying the eggs just slide out of the containers once cooked with no problem at all. You can expect to pay $10. plus $4.99 shipping and for this you will receive 6 Egg Pops and for an extra $4.99 you will receive 6 more. Plus with this double order you will receive two egg separators as a bonus. You aren’t going to have to make much more of a commitment than what you normally would do with the traditional method of cooking hard boiled eggs. Do keep in mind that although they still have the appearance of an egg when cooked, that the bottoms are flat, so they will look slightly different if you are going to use the whole egg for decorating. If the problem of the eggs sticking in the container has truly been solved then the Egg Pops really may be a good idea. There is nothing worse than getting pieces of egg shell in egg salad which can be a result of having to peel the hard cooked eggs. This is a quick and easy method, and the use of the water in the double broiler section of the Egg Pops should keep the texture of the egg white soft and not rubbery. We’re going to give the Egg Pops a Thumbs Up rating. We like the fact its quick and easy which is a big plus for people on the go. It has a non stick lining which should solve the problem that those that bought the Eggies experienced. The water used for the heat distribution should lend to good cooking texture. We suggest that you try your Egg Pops when you have a few minutes of extra time to work with them. Every microwave is different and so the cooking times may vary. You may need to experiment a little at first to get it just right. What do you think? Does Egg Pops work or not? can you still buy Egg Pops and where can you buy them?